529 College Savings Plans in Washington, D.C.
Washington, D.C. sponsors one 529 college savings plan. The DC College Savings Plan is direct-sold and allows families from any state to invest in their children’s educational future with as little as $25 and as much as $500,000—among the highest contribution maximums we’ve examined across the country. Compared with other plans that allow tax-deductible contributions, however, this plan only lets D.C. families make rather modest ones. You can invest in several low-fee portfolios designed for all risk levels. But if you’re hesitant to open an account on your own, you can find a financial advisor to guide you through the entire college savings process and develop a personalized investment strategy for you. How Do I Enroll in the DC College Savings Plan ? The simplest way to open an account with the DC College Savings Plan is online. The process should only take a few minutes. You can also download an enrollment form and mail it in along with your initial minimum payment of $25, which you can send as a check or pay by providing your banking information on the form. You’d need to gather the following details for yourself and your beneficiary: full names and addresses, Social Security numbers or tax identification numbers and bank account and routing numbers if you’re making initial payments electronically. How Much Does the DC College Savings Plan Cost? Each investment portfolio in the DC College Savings Plan charges a total annual asset-based fee that ranges from 0.15% to 0.80%. You don’t pay the fee directly, but rather it’s factored out of the assets in the investment portfolio. The plan also charges an annual account maintenance fee of $10 for D.C. residents and $15 for non-D.C. residents. When examining direct 529 plans sponsored by other states, we found the D.C. option’s portfolio fees range from very low to moderately high. Tax payers in the nation’s capital who invest in the DC College Savings Plan can deduct up to $4,000 or $8,000 (if married, filing jointly) from their D.C. taxable income. But the plan is open to any U.S. citizen or resident alien. All account holders can benefit from tax-free growth on their contributions while they’re invested. Thus, the government won’t touch what your money earns in the market, so you can make the most out of compound interest. You can also take money out of the plan tax-free as long as you use it to fund qualified higher education expenses. However, you can’t use the money for anything else without facing some consequences. Nonqualified withdrawals may be subject to federal income tax as well as a 10% penalty. Seek a local financial advisor or tax professional to discuss how a nonqualified withdrawal may affect you based on your individual situation. You can also discuss other potential tax benefits that may appeal to you. For example, all 529 College Savings Plans provide some unique estate-tax benefits and offer several ways to give money to students while avoiding gift tax. The DC College Savings Plan allows you to invest in portfolios designed for all types of savers from investing newbies to those who have a sense of what they want their investment mix to look like. If you’re new to the game, you may be interested in the plan’s Year of College Enrollment Portfolios. You can choose one named after the year you expect your child to enroll in college. As the date approaches, the portfolio will automatically change its asset allocation to become less risky. Investment managers do this by devoting more of your money to growth-oriented investments like stock funds when your child is young in order to aim for strong gains by taking on more risk. But as your child gets older, the emphasis would switch to safer investments like bond funds to protect what you’ve earned while providing a decent return. But if you want more control over your asset allocation, you can invest in one or more individual portfolios. Each invests in a single underlying mutual fund or exchange-traded fund (ETF). Each fund included different asset classes like international stocks, bonds and even socially responsible equity funds. The plan also offers a Principal Protection Portfolio, which invests your money entirely in a funding agreement issued by the Ameritas Life Insurance Corp. to the District of Columbia Section 529 Plan Trust. This option provides a set interest level daily at a minimum annual effective rate. This portfolio may suit you if you’ve been saving for a while and believe it’s time to protect what you’ve earned or if you have a low risk tolerance. But remember, portfolio options and what they invest in, as well as fees, can change. So be sure to check on your investments periodically. 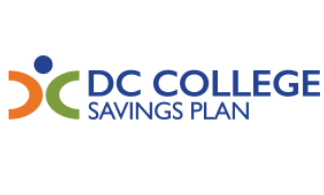 How Do I Withdraw Money from the DC College Savings Plan? You can request a qualified withdrawal online by visiting your account. You can also request any kind of withdrawal by downloading a withdrawal request form and mailing it in. You can choose to direct the payment to you, your beneficiary or the educational institution you’re funding. If you’re still hesitant to go in it alone, a financial advisor can guide you through the investment-selection process as well as the overall college savings terrain. If you’re not sure how to go about finding a professional to work with, you can use our free SmartAdvisor tool. It asks you a few simple questions and then connects you to qualified advisors in your area based on your financial situation and goals. Many also specialize in specific areas like helping families save for their children’s college education. You do not have to live in Washington, D.C. to invest in its 529 plan. Take a look at these other states' 529 plans.